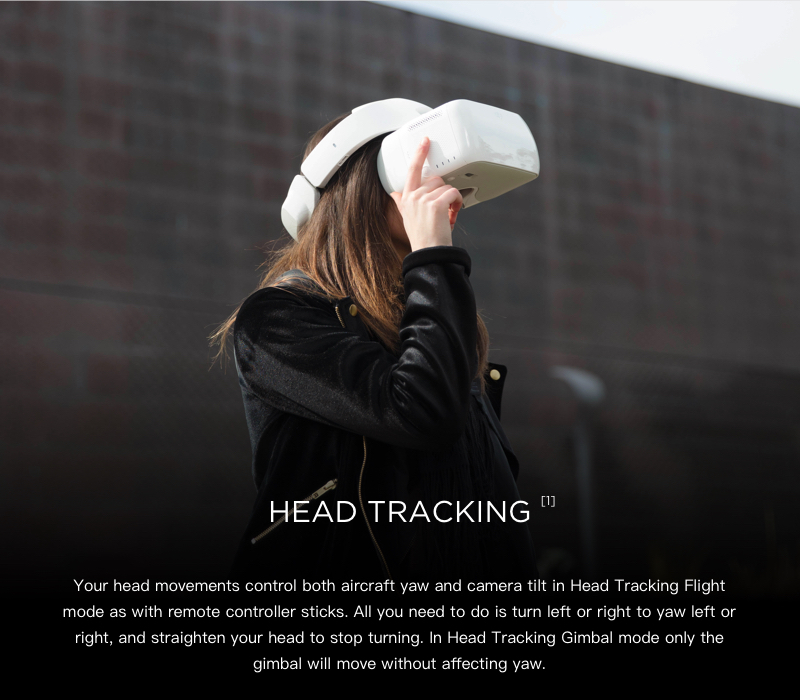 DJI sine egenutviklede FPV-briller. Full HD i hvert øye tilpasset Spark, Mavic Pro, Mavic 2 Zoom/Pro og Inspire 2. DJI sine egne FPV briller, som er direkte kompatible med Spark, Mavic Pro, Phantom 4 og Inspire. Disse tar droneopplevelsen til nye høyder! 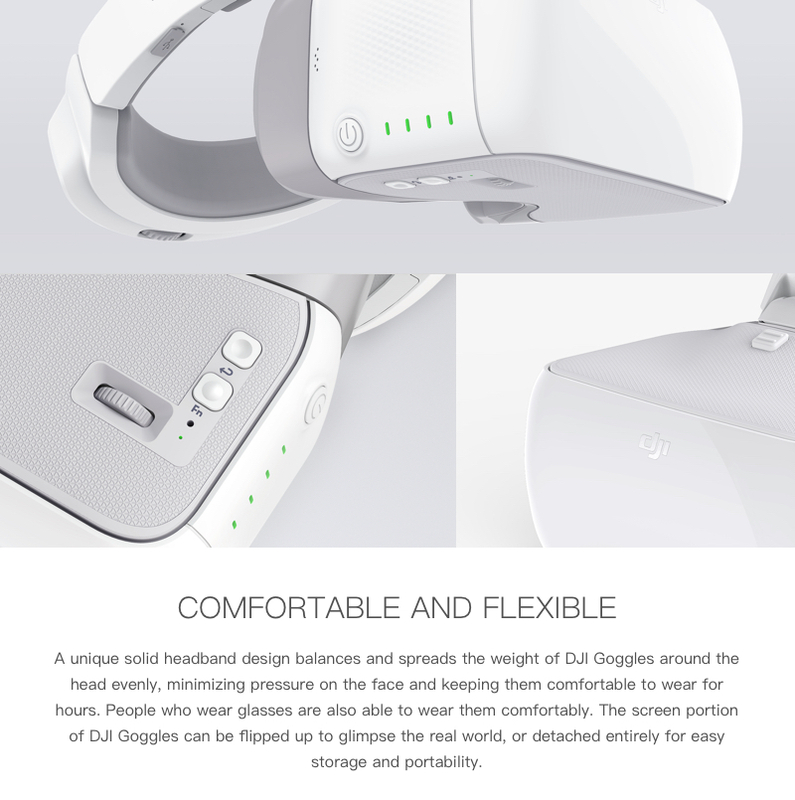 A DJI Goggles - Micro USB OTG Cable is required when working with Spark. 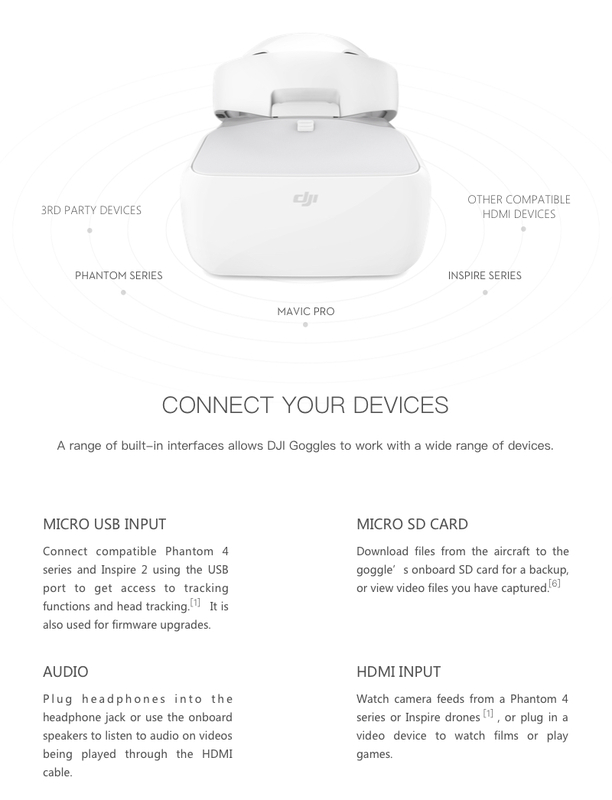 A DJI Goggles - HDMI (Type A) Female to HDMI (Type C) Male Adaptor is required when working with Inspire 1 series. 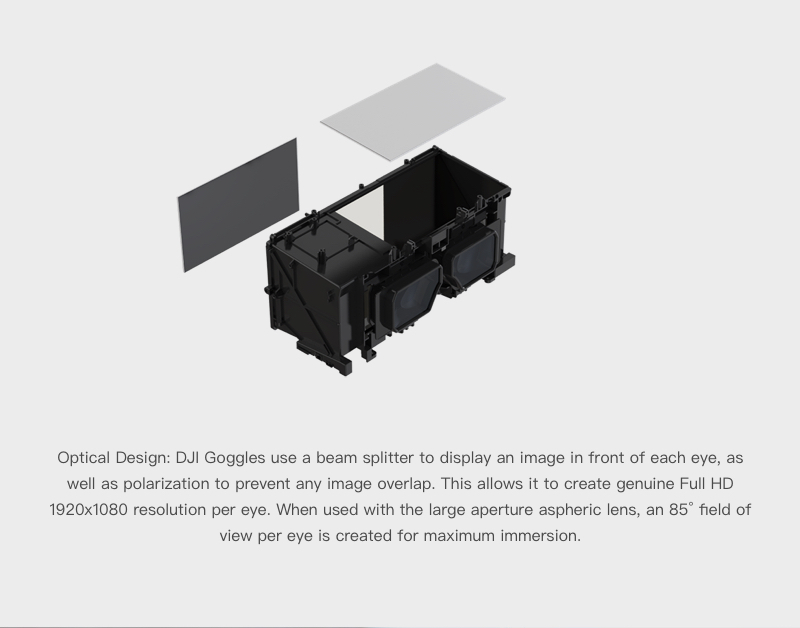 DJI Goggles supports Mavic Pro, Phantom 4 series and Inspire series. 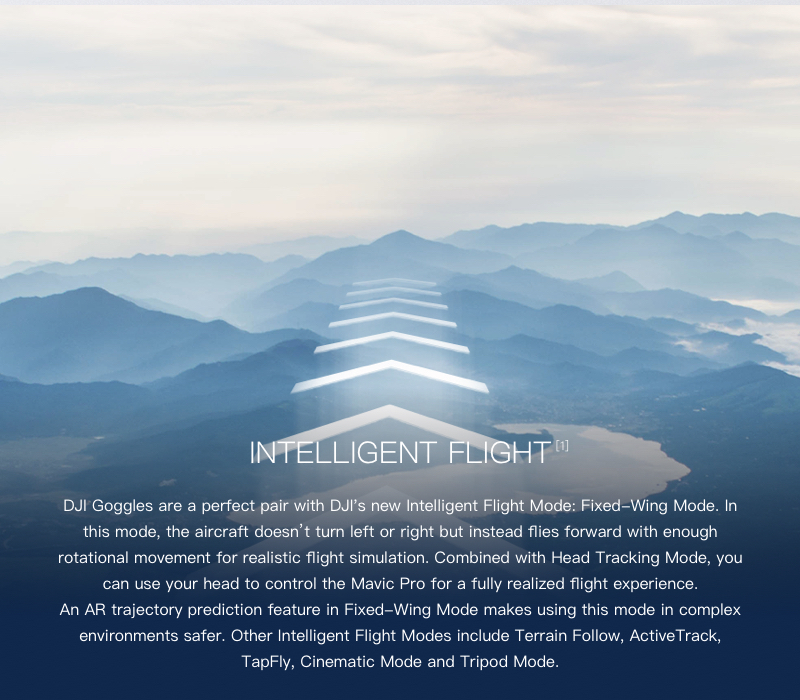 Some functions will be adapted for different DJI Products. 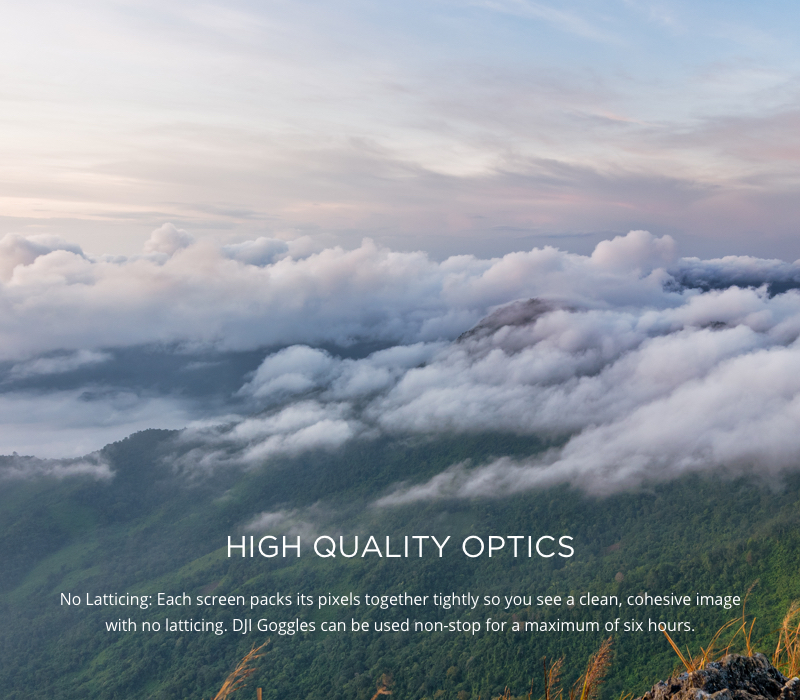 HD mode: 1080p/30fps: near-field with no interference; 720p/30fps: at long range or with interference; Smooth Mode: 720p/60fps. 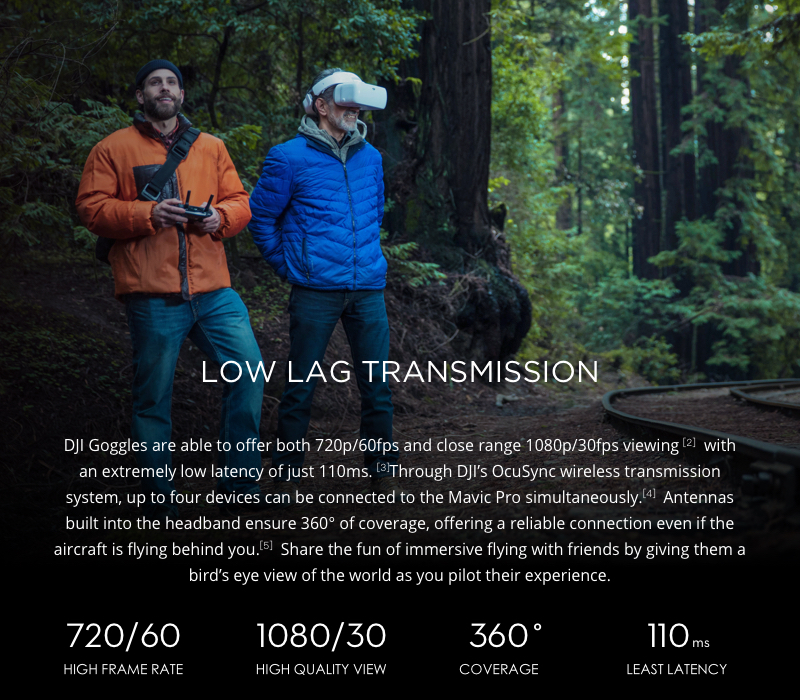 Using the Mavic Pro, stream wirelessly at 720p/60fps and record video at 720p/120fps. 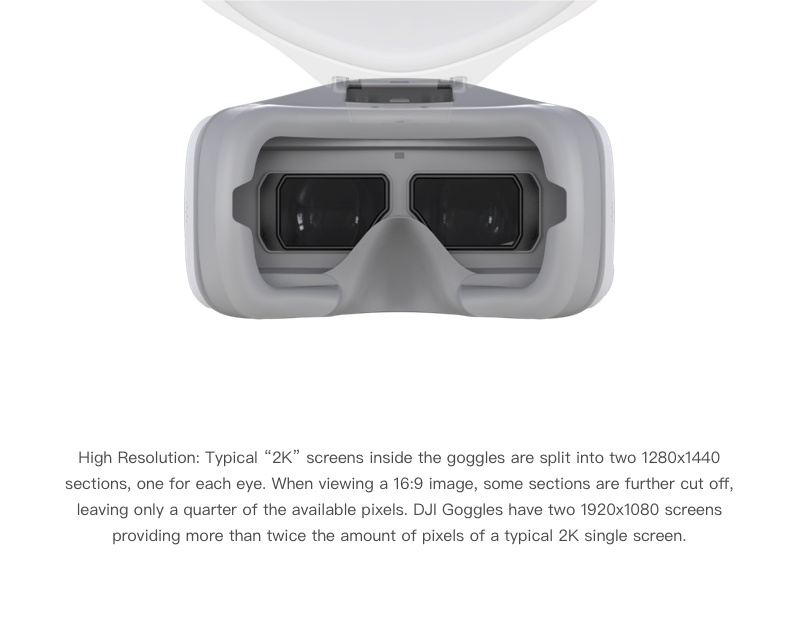 For Mavic Pro with two pairs of DJI Goggles and two RCs only. 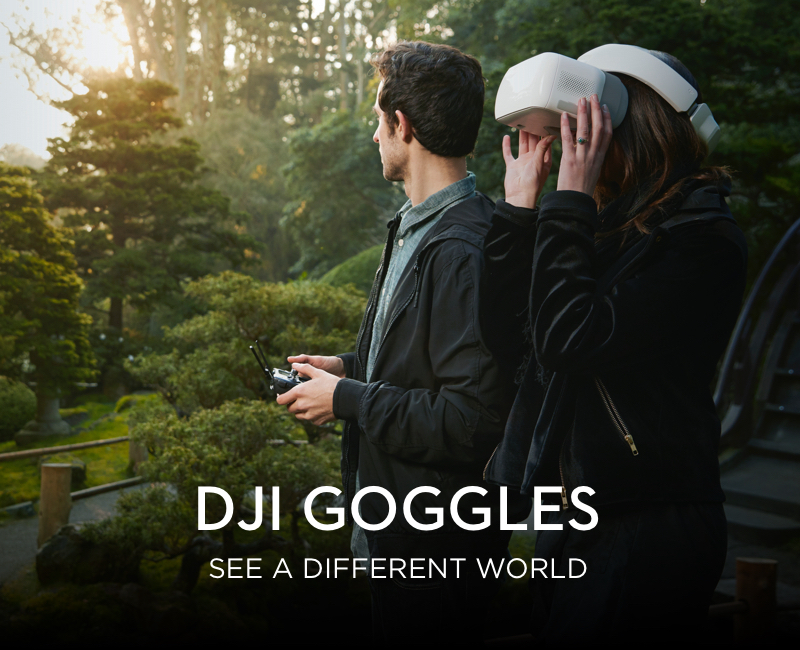 The use of a spotter is essential when wearing DJI Goggles. The aircraft should not fly beyond the spotter’s line of sight. 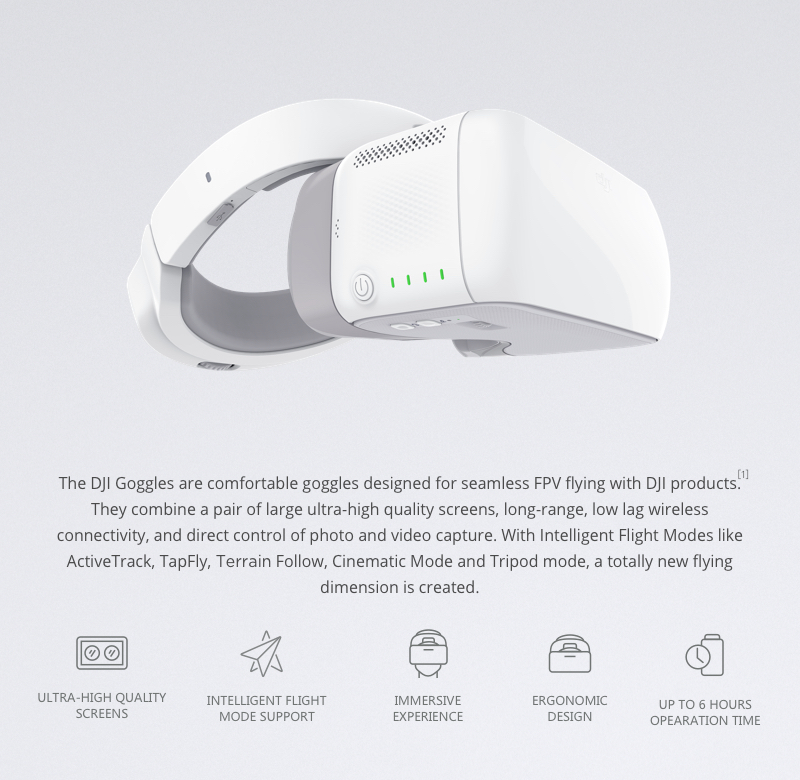 DJI Goggles can only play content downloaded from DJI drones. Insert the headband buckle into the slot above the lenses until you hear a click. Check that it has been fastened securely. 2. Align the lenses over your eyes and pull the strap down. 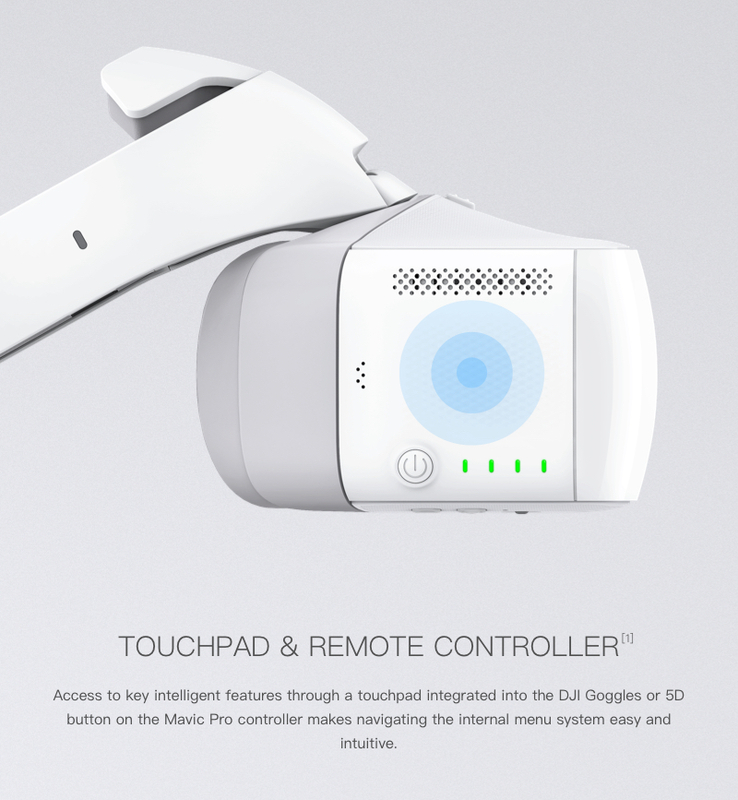 Adjust the strap knob until the headset fits snugly and comfortably on your head.